Type systems and compile-time type checking are great things that can save you a couple of hours of debugging and also have documenting potential, could make the code more understandable. In my opinion, it’s wise to use them, and unfortunately, sometimes we don’t do this enough. Consider Integer/Int/int. A counter could be Integer, an entity identifier could be Integer, an integer number in arithmetic expression could be Integer. In most cases all this Integers have nothing to do with each other: in your domain it is a bad idea to compare them, do arithmetic operations on them, pass one instead of another as a function parameter etc. In one of my projects (in C#) there are a dozen of domain entities that have integer identifiers that are passed all over the code. After a couple of bugs connected with mixed up identifiers of different entities I’ve solved this problem by replacing plain integer numbers with structs (in C#, structs are value types used for representing lightweight objects such as Point or Color) like Id<EntityName>T (T is to distinct type from property names). The key idea was to introduce a new level of types to let the type checker intently look at the code instead of me. It’s worked: I’ve gotten rid of some old bugs in rarely used parts of code and hope new bugs of such a type won’t bother me in the future. (Aside: I hope, this post will persuade you not only to consider using value classes but also to think about the role of types in code quality). These identifiers aren’t created very frequently but anyway there is overhead (though small). Scala can help here even better with a feature called value classes. Value classes are special wrapper classes that give an ability to enrich objects with more precise types and additional methods without allocation overhead. def processWombatOld(idWombat: Int) = ??? def processWombatNew(idWombat: IdWombat) = ??? Compiler prevents bad things from happening. However, if you decompile the code with javap, you won’t see any bytecode difference between processWombatOld and processWombatNew – idWombat will be represented as good old plain int. All checks are done in compile time. The secret is in extending AnyVal class. 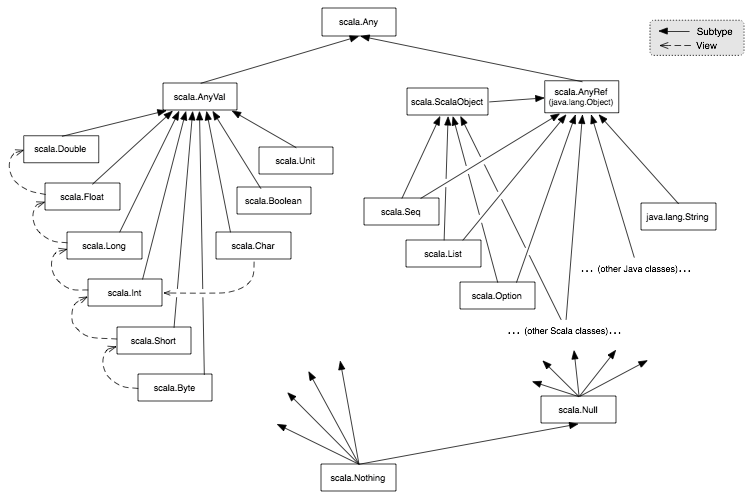 If we look at Scala’s class hierarchy (picture below; from here), we’ll see that primitive types such as Int or Double inherits AnyVal. Must have only the primary constructor with exactly one val-parameter whose type is not a value class already. No vals or vars members are allowed (by obvious reasons), but with defs the compiler can do a trick, so you can add them. Must have no nested classes, traits, objects. Must be a top-level class or a member of a statically accessible object. Can’t define equals or hashCode methods. There is also implicit conversion from Int to RichInt in Predef (as well as for other primitives). As you can see, it let us write 1 to 20 that’s equals to new scala.runtime.RichInt(1).to(2) with nearly zero runtime overhead. It’s cool. In case of runtime type tests such as pattern matching. When treated as another type. Demonstrative example: in println(myValue) println has a parameter of type Any, so myValue of a value class will be actually allocated and then converted to Any. Do println(myValue.toString) instead. In case of assignment to an array. Also, there is a bug-prone corner case. Obviously, there isn’t any information about value classes at runtime, they’re represented by classes they wrap. So, the reflection mechanism isn’t able to see your value classes in functions’ parameter lists, for example. I’ve discovered a bug in Akka connected with this. To sum up, in my opinion, value classes is a nice feature of Scala that could help you to make a type system in your code a little more powerful; also it’s used by the runtime to reduce the overhead of enriched types. But when using them, you should be careful with the reflection. You could find more information about value classes in the official documentation or in more formal SIP document.